What Five Famous (Dead or Alive) People Would You Invite To Dinner? So I went on an interview today. Post-Interview, I feel really good about my presentation and answers. I worried over what to wear. I have recently lost about 23 pounds so my “large girl” pants no longer fit and my older “NYC attire” is a hodge podge (some still a little tighter than appropriate for an interview). I settled on a conservative pinstripe shirt, black slacks and my favorite black bra. I felt good in the outfit, comfortable. So, imagine my surprise when I had to go through a “pat down” because the under-wire in my fave bra set the metal detector to beeping! I am applying for a position with the Dept of Education within the WV Dept of Corrections (Women’s Facility). And I half expected needing a pat down (as security is essential). I just giggle as I think about it. If I am lucky enough to secure the position, the detector will be set to a less sensitive setting. I know a few of the current employees at the prison so, although nervous, I was not on full-throttle nervous. 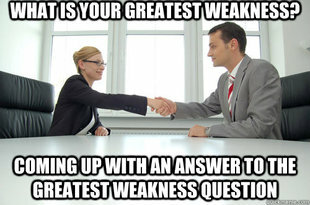 After almost two decades in some form of HR position, I was familiar with the questions they asked and knew the answers they would like to receive. At the end of the interview they handed me two sheets of papers for a written portion of the interview. Q: If you were able to invite any five famous people (living or deceased) to dinner, who would it be and why? A: 1. Einstein (his combination of wit and intelligence would allow for great dinner conversation); 2. Elvis (but I would expect him to sing for his supper); 3. Martha Stewart (but I would expect her to come before the meal was served so she could help me with the center pieces); 4. Nelson Mandela (after suffering from so much strife, I would love to get his take on the current state we find this world in); and 5. Roberta Mancino (I would find it interesting to pick her brain on how she excels at such a male dominated sport). Keep your fingers crossed for me…. I will update you as soon as I know.